So, the title of this post isn't exactly true. I did actually get a lot of work done. Not nearly as much as I would have liked, but enough not to fall too drastically behind. It wasn't a total day off, but the impressions that are left at the end of the day are the ones made while getting unstuck. I went down to Linn Run State Park and hiked around Adam's Falls. It's a short trail and I was looking forward to seeing the waterfall there for the first time. As I walked along the trail, I noticed several examples of mushrooms and fungi. Ever since the mushroom walk, I've been made more perceptive of them. To the left are the tasty chicken mushrooms. An entire log was covered with them. I harvested a few, but left the majority. Tomorrow I'll make chicken (mushroom) salad sandwiches for lunch. To the right are puff balls. I love the fans of color on the underside of these polypores – subtle combinations of dusty rose, magenta, and pale purple. The tops were a creamy white, striated with bands of tan. Nature is full of color inspiration. I couldn't find the waterfall. So I walked along the trail. Parts of it were extremely rocky. Others were blocked with fallen trees, slick still from yesterday's rain. I slipped a few times (the shoes I wore have no traction), but enjoyed the walk. In the woods, I came across the ruins of old cabins. I could tell that they were destroyed at one time by fire. Some of the rotting planks, looking like fallen trees, were blackened and charred. 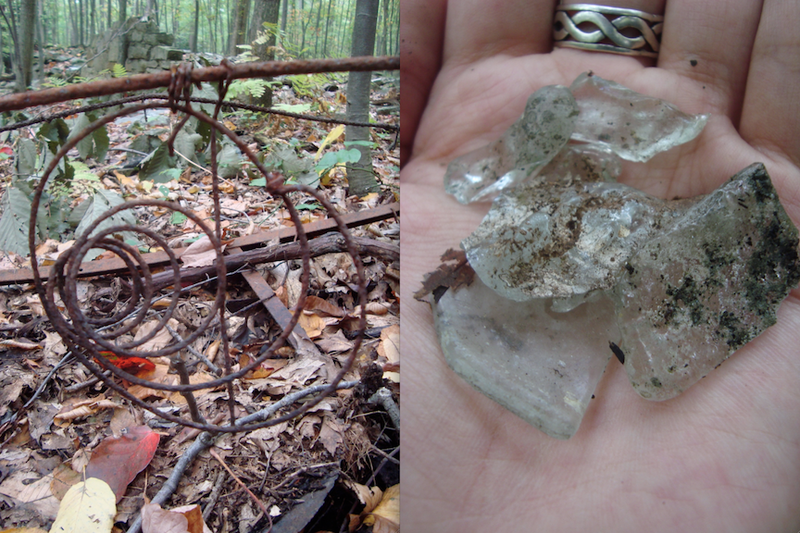 I found some glass. There were no hard edges or fresh fractures. The edges were smooth and bubbly. Darker specks of dirt were fused into the surface of the glass, signs of fire. Nothing remained, except for the stones being swallowed up by the forest and the rusty reminders of sofa springs and bed frames. Frustrated that I couldn't find the waterfall, I walked back to the trailhead and searched for a map of the area. I found a map, but it didn't seem right. It said that the waterfall was really close to the start of the trail. I saw nothing. I heard nothing. And then it clicked. I had walked over a bridge spanning a dry creek. Only parched pebbles and powdery stones lined the bed of the once stream. I circled around and saw where the waterfall was meant to be. Now only a trickle of irony water sprinkled over the slate walls of the huge depression. Names and dates and sentiments of forever were carved, painted, and scratched into the walls of the dry waterfall. I hiked back down to the car and found the stream that runs parallel to Linn Run Road. I could imagine it in the spring, swollen with snowmelt. Today it gurgled by, revealing the smooth, round rocks perfect for skipping. On my way back from my little adventure, I stopped along the side of the road. I was struck by the wide, flat swatches of green leading up to a tree-covered mountain. The leaves of some of trees have turned bright gold and litter the ground in what looks like a carpet of coins. I'm thinking of playing hooky today. It's true that there's a small pile of work that needs to get done, but I feel like fresh air and doughnuts with a thermos of hot coffee might be just want I need to get unstuck. (Because logically, if I'm not doing my work, I must be stuck in some form or fashion. Logically speaking.) Maybe I'll go for a hike or make a trip to one of the local waterfalls? Perhaps I'll bring a small jewelry-making kit or some watercolors and work outdoors today? This week, Lark Crafts is giving away seven more of their 500 series books to one lucky eligible participant! Up for grabs are 500 Judaica, 500 Beaded Objects, 1000 Glass Beads, 500 Knives, 500 Metal Vessels, 400 Polymer Clay Designs, and 500 Enameled Objects. All you have to do to win these books is to leave a comment on their blog post. The giveaway runs until 9PM EST on Monday, October 4th. CLICK HERE to find out more and to enter to win! After PotatoFest, I was curious how many potato-themed beads I could come up with. I was a little surprised how few potato components are actually out there. I imagined that since the iconic edible tuber has a relatively simple shape, that there would be more. A) Rustic khaki vegetable ivory nut bead from For The Love of Beads. B) Dusty rose freshwater potato pearls from Etsy seller mintdestash. C) Sterling silver Idaho potato charm from Amazon. D) Mr. Potato Head lampwork glass bead by Glastastic Treasures. E) Fine pewter Potato Fairy pendant by Green Girl Studios. F) Tagua nut pendant from Sun Country Gems LLC. 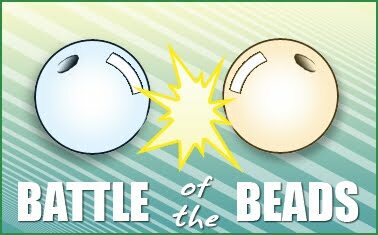 You have just two days left to participate in the Auntie's Beads competition, Battle of the Beads! Dig out your Auntie's Beads stash and get to work! This contest puts customer jewelry designs up against each other for a chance to win some amazing prizes. Who can say NO to free money for beads and jewelry-making supplies? For more information, CLICK HERE. Hurry! Time's running out! UPDATE: I just got word that the fine folks at Auntie's Beads have moved the competition to their Facebook page for a more seamless voting process. Since they've made this change, they are extending the contest another two weeks! That's two weeks extra to get your competition piece in! CLICK HERE to go to their Facebook Fan page to find out more and for your opportunity to enter to win! Anne Choi just debuted four new designs! Whenever I get a notification newsletter, I race over to see what she's been working on. I adore her work and am always curious to read what has inspired the latest designs. You too can sign up for her mailing list by CLICKING HERE. Two of the four sterling silver beads have elephants on them. An elephant with an upturned trunk is a symbol of luck and good fortune. Her bead with the lucky elephant has three holes, making it an ideal focal element. Elephants are also known for their memory and intelligence. The other elephant bead was inspired by this and has an E. M. Forster quote that reads, "Unless we remember, we cannot understand." The other two new designs feature quotes. One of my first Anne Choi beads was a quote bead. I've carried that bead around for years; sometimes loose and sometimes strung up. It has become a talisman. Her latest quote beads feature words by Jonathan Swift and George Eliot. The Swift quote reads, "Everyones desires to live long, but no one would be old." And the Eliot bead says, "Necessity does the work of courage." I just wanted to thank everyone who participated and really made this a special birthday. Thank you for sharing it with me! I appreciate your support and encouragement. Your kindness is profound and humbles me deeply. I wish that everyone could take home a prize. Unfortunately only five can win. Congratulations to the winners! Please email me your contact information, so that I can drop your prizes in the post! Keep an eye out on Thursday for another chance to snag a prize! 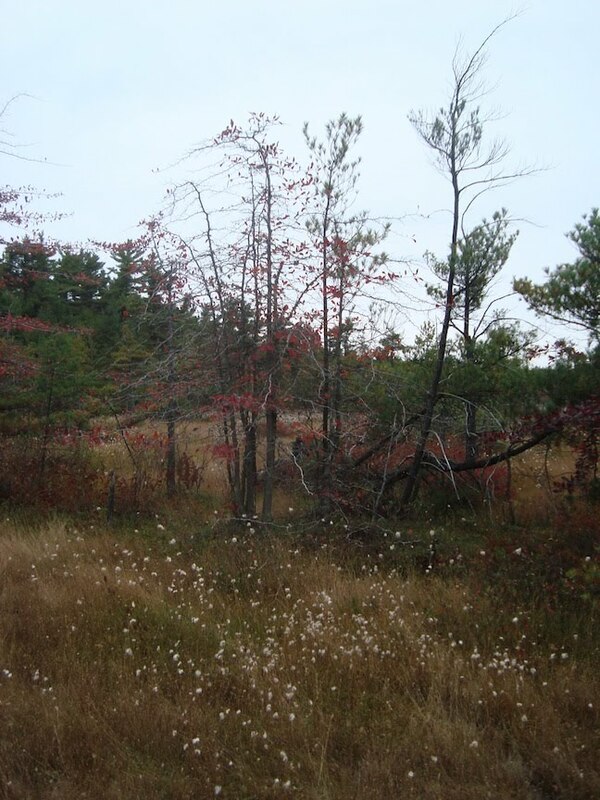 Yesterday, we joined the Botanical Society of Westmoreland County for a field trip to the Spruce Flats Bog. We drove along a winding road, cutting through the Linn Run State Park and Forbes State Forest. Lining the road were summer cabins and fountains trickling sweet, mountain spring water. The paved road gave way to gravel and the cabins became fewer, replaced by colorful maples, evergreen hemlocks and copper-colored cinnamon ferns. We parked at the Laurel Summit Pavilion and walked through the woods towards the bog within the Laurel Summit State Park. Along the path to the bog, we identified several plants. Above are just a few of them. To the left is an Indian cucumber root (also known as Medeola virginiana). One of the identifying traits is the two tiers of leaves. Apparently the name is derived from the edible root that resembles and tastes like a cucumber. The berry shown is, however, not edible. In the center are the leaves of the dewberry plant. The dewberry is related to raspberries and produces soft, sweet purple berries. To the right is an example of ground pine or Lycopodium obscurum. Although it looks like a conifer, this is actually a clubmoss with creeping rhizomes. Sometimes the ground pine is called "Wolf's Foot" because of the resemblance of the branches to a stylized wolf paw. In fact, the name, "Lycopodium" means "wolf foot". We walked through the woods until we came across an old wooden dock extending into a sweeping clearing covered in grasses, sphagnum moss, and the occasional bleached wood of a long-fallen tree. In some spots, the thin layer of grasses was bare, revealing the smelly mud beneath. Walking through the bog, it's important to remember to tread carefully, stepping lightly and to keep moving. If you stand too long in one spot, you're at risk of sinking! The bog may look barren, but the low-nitrogen, highly acidic ground produces a unique environment for unusual plants like carnivorous ones. 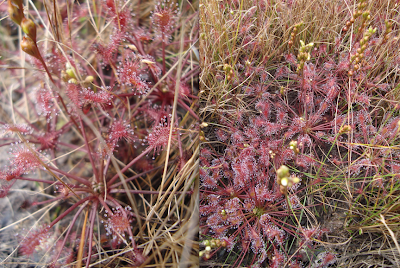 The above photos are of the sundews, also known as Drosera. These carnivorous plants have spoon-shaped tentacles covered in secreted mucilage. The sticky substance attacks and captures insects, which supplements the plant's dietary needs not met by the soil. 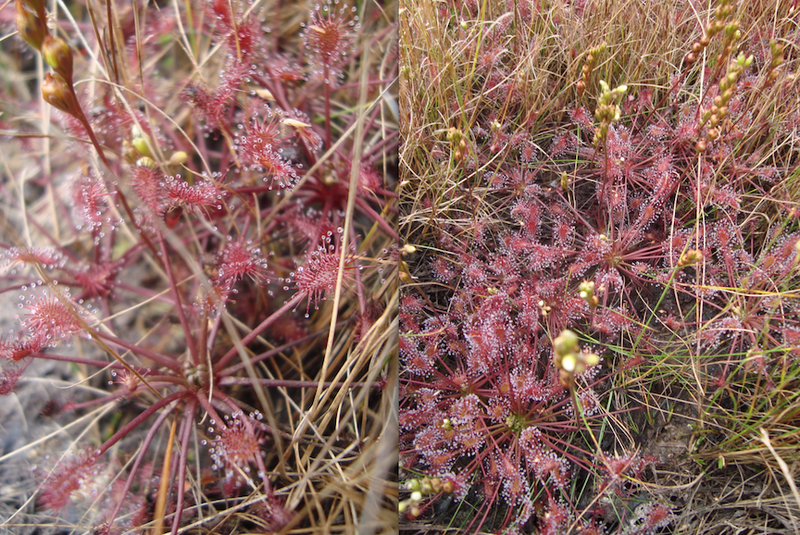 The sundews were not the only carnivorous plants! Studding the hay-colored grasses were the bright red, deep burgundy and vibrant green flute-shaped Sarracenia. The pitchers have a substance on the lip that attracts insects and in some cases paralyzes them. The insects fall or crawl down into the tube-like plant structure, where rainwater collects and helps digest the bugs. Fine, downward-facing hairs speckle the inside of the pitcher, preventing insects from crawling out. It has been said that small animals like mice have fallen pray to these carnivorous plants. These sarracenia plants have a story and so does this bog. The bog wasn't always here. Like many of the other summits in the area, glaciers long ago scraped the peaks off, creating sandstone plateaus. This particular plateau has a basin-like shape, where rain-water and spring run-off collects. After thousands, if not millions of years, sediment collected and huge hemlock trees grew up. Deforestation in combination with a brush fire, stripped the land. Once the trees were gone, there was nothing to siphon off the excess water. The water began to collect again, breaking down the ash and dead plant matter, reverting the shallow basin into a bog. The sarracenia plants are not native to this bog. In the 1950's, the Botanical Society of Westmoreland County saw the barren state of the bog and transplanted the carnivorous plants that thrive in low-nitron soil in an act of conservancy. Yesterday, the new generation of that same botanical society returned. We carefully made our way across the Spruce Flats Bog, spotting sarracenia plants – descendants of the original plants brought there, a living legacy. Above are the dried flowers and seed pods of the sarracenias. They rise out of the flute-shaped plants like bent shepherd's hooks. Above and to the left is another portion of the Spruce Flats Bog covered in cottongrass. This sedge has white puffs and grows abundantly in the marshy area. 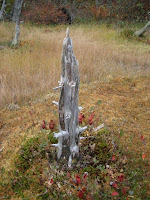 To the right, sarracenia, sphagnum moss, sundews, and giant cranberries grow around the base of a bleached stump. The bog is a magic place, where closer inspection reveals much. The above picture is a close-up of one of the giant cranberries that grow there. The tart, red berries can be found on the low-growing shrubs that trail along the bog. If one didn't know they were there, it would be easy to pass them by. The trip to the Spruce Flats Bog with the Botanical Society of Westmoreland County was highly enjoyable. Mishaps with sinking boots and muddy trouser legs provided lighthearted entertainment and quite a few laughs! Not only are the field trips a nice way of getting acquainted with natural places (and the other members), but it's a great way to squeeze in a little exercise and learn new things. I always learn so much! The field trip was the perfect way to celebrate my birthday and the season. After the mushroom hunt in Blairsville, we drove out to Ebensburg for the annual Potato Fest! The entire downtown of the city is converted into a craft fair, studded with potato-inspired booths. The festival celebrates Ebensburg and Cambria County potato-growers. They are the second largest supplier of potatoes in the state! Thousands of people descend upon Ebensburg the last Saturday in September each year. Many of the streets are shut down for the festivities. There was live music, street performers, fair food (my favorite! ), crafts, and a huge wine tasting event featuring several local wineries. There was a lot of other (non-potato) food available as well. Funnel cakes are an essential component to a successful fair experience in my opinion. Even with the most careful hand, it's nearly impossible to enjoy one without in someway getting covered in a dusting of powdered sugar. This did not deter me from diving into this unusual "birthday" cake. Above is one of my birthday presents and the man who made it. His name is Ed. 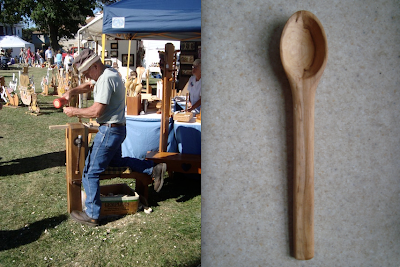 He and his wife are based out of Hastings, PA and made handcrafted wooden utensils and furniture items. I love that I was able to meet the artisan behind this beautifully carved spoon. Every time I cook with it, I'll think of him, his wife, and my birthday. After the last post about my adventure gathering mushrooms, I was inspired to put together a sampling of various mushroom-themed beads, pendants and components. These are just a taste of the many varieties out there. Best of all, you don't have worry about these being poisonous or toxic! A) Lampwork glass pendant by Michele Goldstein. B) Ceramic button by Marti. C) Sterling silver pendant by Silver Enchantments. D) Lampwork glass focal bead by Alexis Berger. E) Silver Mushroom Man pendant from Alisa Masiejczyk. F) Fine pewter pendant by Green Girl Studios. G) Lampwork glass focal bead by Alexis Berger. H) Antique gold-plated pewter pendant from Fusion Beads. I) Lampwork glass pendants by Annie Destito. J) Sterling silver psychedelic pendant from Amazon. Had anyone told me beforehand that I would be willingly waking early on my birthday, I probably would have told them that they were crazy! But I did wake up early (not without the aid of a pot of coffee) and enjoyed myself immensely! We went out towards Blairsville to go on a mushroom walk at the Pine Ridge Park with the Indiana County Chapter of the Western Pennsylvania Mushroom Club! It was our first time mushroom hunting and were a little unprepared, but had fun nonetheless. Since it was our first time, we mostly took pictures of as many different kinds we could find and brought back samples for identification at the end of the walk. 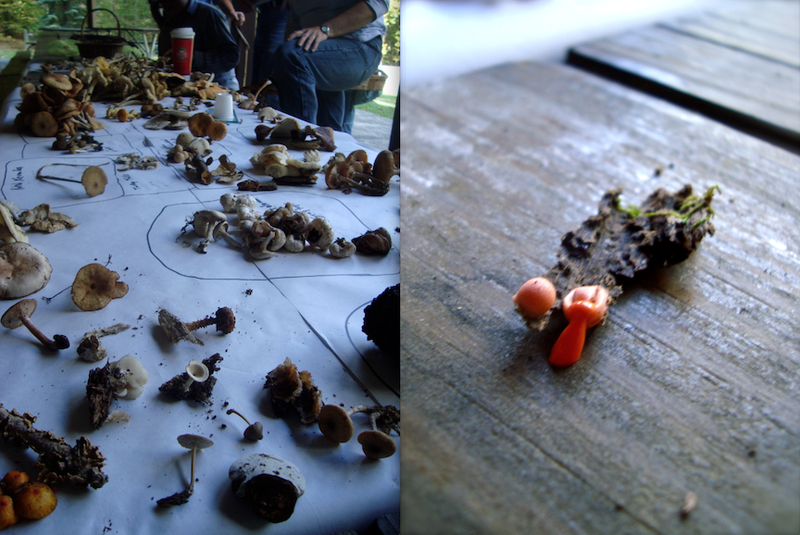 We did not know enough about mushrooms (and which ones were safe to eat) to gather any for consumption. I was surprised by how many different types of mushrooms we came across. The forest provided excellent conditions with lots of decaying plant matter and fallen trees for mushrooms and other fungi to grow around. The one of the left, that looks like a stubbly breast, is a "gem-studded" puff ball. Apparently these are safe to eat while they are white and marshmallowy on the inside. When they darken and turn to spore, they are no longer good to eat. About midway through our walk, we ran into the leaders of the club, Bob and Ginny. We had a piece of the "yellow chicken" or Laetiporous sulphureus and the above picture. Apparently these are edible and highly desirable. We didn't know what it was, but upon showing them the piece and the picture, they implored us to go back and harvest the rest. We did end up taking this one back home for breakfast the next morning. Many people who have tried it say that it gets its name because it "tastes like chicken" but I've noticed that many of those recipes include chicken stock, which would most definitely make the mushroom taste like chicken. However, where the mushroom gets its name probably originates when it is pulled apart. The flesh of the mushroom very much looks like the slightly stringy meat of cooked chicken. I sauteed the cleaned mushrooms in butter and seasoned it with a little bit of curry, cayenne pepper and smoked paprika. I added the cooked mushrooms to caramelized onions with a sprinkle of balsamic vinegar. This mixture was spooned on top of scrambled eggs. I must say that the yellow chicken mushroom was very delicious! The most found mushroom of the day was the honey mushroom or Armillaria mellea (also known as pidpenky or pipinki). These are commonly referred to as the autumn mushroom since they are abundant during fall. They usually have a dusting on yellow on top (which is sometimes bioluminescent and probably where it gets its name). It's important when harvesting these for food, that a spore print be made. If the print is white, then it is edible. If it comes out grey, brown, or slightly purplish, the mushroom is actually a toxic Galerina! In the center are turkey tails (or Trametes versicolor). It's a common polypore mushroom with many look-a-like species. It can be distinguished from other similar looking varieties by the pores on the underside. This common fungus is also used in Chinese medicine and has immune system boosting agents and has been used to fight cancer. At the end of the walk, everyone laid out their finds to be identified. It was interesting to see the different kinds. I was in awe of just how many there were and made eager to learn more about mycology. Bob also had some interesting information about different fungi that attacked other fungi and produced what are called Aborted Entoloma. Sounds like the premise of a science fiction movie, no? One of the other members found the globs to the right. They are a species of plasmodial slime mould called Wolf's Milk Slime or Lycogala epidendrum. When smashed, they produce a gooey, pinkish, orange slime! I had a most excellent birthday weekend! It was filled with all sorts of wonderful activities. (For the sake of manageability, I'm going to break each event into separate blog posts.) The weekend was a lot of fun and I'm sad it's over now. I also wanted to take a moment to thank everyone who expressed their birthday wishes here and on the other various social media outlets! I appreciate all your many kindnesses. THANK YOU! I loved all the gifts I received this year, you all are far too generous! (I'll blog about everything later as well.) I did receive some mysterious gifts in the mail without a clue as to who to properly thank. If you sent me a living stone plant, it arrived safely and in good condition and I love it. I will add it to my succulent collection. Please email me, to allow me to show my gratitude! Thanks again for all the birthday wishes! They did much to make my heart buoyant with happiness! This week we have a Monthly Challenge treasury to share and inspire you. 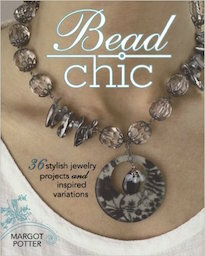 Check out the review and giveaway of Bead Chic by Margot Potter. Another felted and beaded pendant is turned into a necklace by Carmi. This week's Wednesday Wire is all about the rings. Melanie faces her fears of home improvement by relating it to her beloved jewelry crafts. Katie's dreaming up jewelry projects inspired by the season. 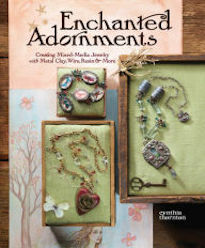 Leave a comment for a chance to win a Beads, Baubles & Jewels DVD! 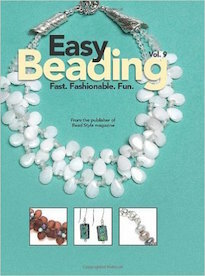 Lorelei and Nancy Schindler paired up for a beading challenge, check out the results here! Jean reviews the amazing tutorial, Color Drenched Metal, by Shannon LeVart, which is available at Shannon's Etsy Shop: missficklemedia. This is a FANTASTIC opportunity for eager designers to learn how to patinate a variety of metals in gorgeous, vivid colors! To celebrate his birthday, Andrew hosts a week of giveaways! Five days! Five giveaways! I was having a hard time getting to sleep last night. It dawned on me as the sky started to lighten that I was indeed a little nervous about the surgery today. A little sluggish, I made my way out to the hospital to get it done. Everyone at the hospital was extremely kind and made sure that I was as comfortable as I could be. The procedure didn't hurt very much and was over fairly quickly. I was curious about all the implements and activities. The hospital is like a hive of bees, busily working. Now that the biopsy is done, I have to wait until my follow-up visit on to find out the results and hopefully the course of treatment. 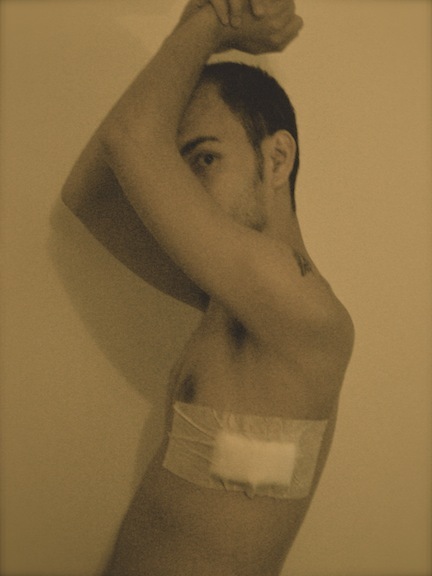 My side is sore and the spot stings, but I feel less burdened. It's as though a weight I didn't even know was there was lifted. Answers, for good or for bad, are soon to be revealed. Today is the fifth and last giveaway in the Birthday Week series! (I know, it's technically a "work week" with five days and not a "real week" with seven days.) The prize comes courtesy of my shop with a little help from my friends. One lucky winner will claim this amazing prize! It's composed of LOTS of goodies! The skulls are perfect for Halloween or could easily be incorporated into some really fun, edgy jewelry! Included are several carved bone skull beads, magnesite skull beads, wooden skull beads, a fine pewter skull pendant from my family, vintage buttons, ceramics from Elaine Ray, a bronze skull cross from Candice Wakumoto, ceramics from Keith O'Connor, a shibuichi skull from Bob Burkett, a shibuichi skull and crossbones pendant by Lea Anne Hartman, ceramic skull beads from Gaea Ceramic Beads, polymer clay from Pam Wynn, a sawdust and resin bead from Priscilla Marban, a ceramic skull pendant based off of a New England tombstone by Diane Hawkey, Czech glass, and a long strand of quartz chip beads from Bead Trust. 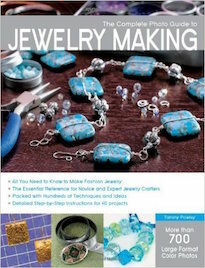 I've included work from some of my favorite beadmakers and jewelry artisans. Most of the skull beads are available in the Skull section in my shop (or will be available for purchase starting in October). Work by Keith O'Connor will also debut in my shop in October! To win these beads is really easy. All you have to do is leave a comment on this blog post. One person will be randomly selected from the comment section of this blog post on Monday (September 27th) at midnight EST. Do be sure to leave your name and contact information if it doesn't already appear in your comment! This giveaway is open to all participants, including international readers. There's still time to enter! Be sure to leave a comment on the giveaways you want to win! Don't forget to leave your name and contact information if it doesn't already appear next to your comment. All of these giveaways are open to everyone, including international participants! "We have long forgotten that activities can be simple and precise. Every act of our lives can contain simplicity and precision and thus can have tremendous beauty and dignity." 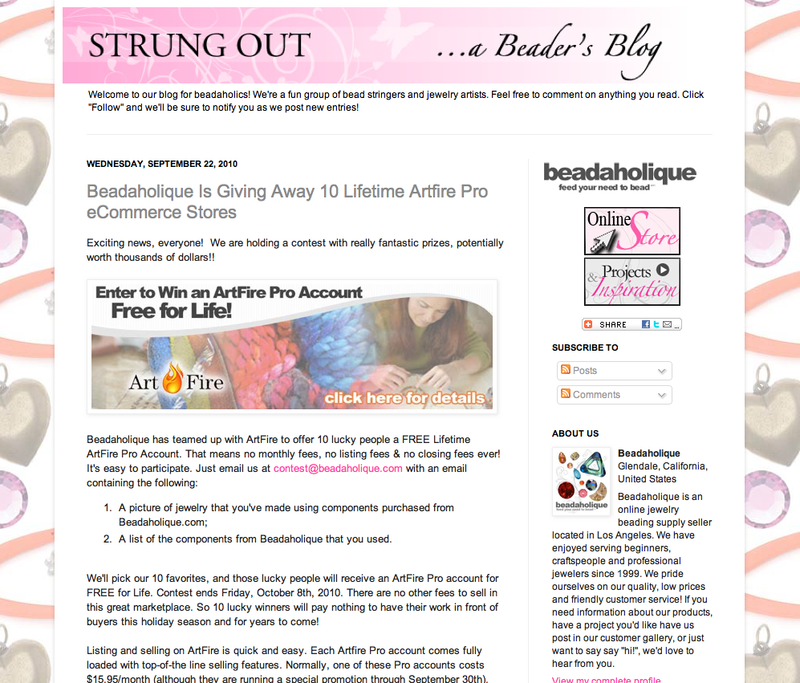 Beadaholique has joined forces with ArtFire to offer a really unique giveaway. The prizes, in the right hands, are potentially very lucrative opportunities. 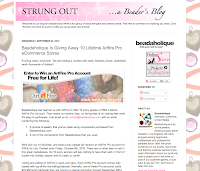 Up for grabs are TEN Lifetime ArtFire Pro eCommerce Stores! NO FEES EVER! To win, all you have to do is send an email with a picture of a piece of jewelry you've made with beads purchased from Beadaholique and a list of the components. They'll pick ten of their favorites to receive this wonderful opportunity. Hurry! The contest ends Friday, October 8th! CLICK HERE for more information. Today marks the fourth giveaway in the Birthday Week series! 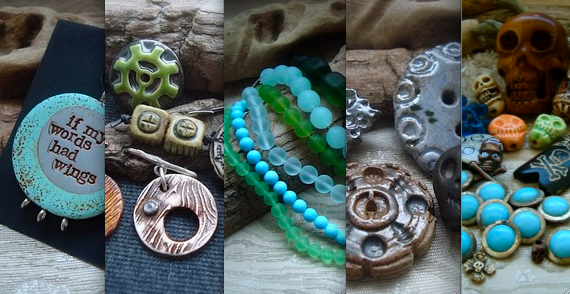 Up for grabs are a selection of ceramic buttons and beads from Lisa Peters Art. One lucky winner will score this small treasure trove of ceramic goodies courtesy of Lisa! I love the earthy feeling of Lisa's work. She's got a knack for capturing the organic feel of stoneware clay and creating some really interesting pieces. For instance those big buttons could easily end up being clasps in a chunky bracelet or incorporated into "conversation" rings with wire or a rivet post. 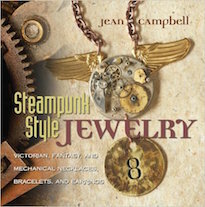 I've seen some really awesome, edgy Steampunk-esque leather cuffs using Lisa's ceramic buttons and cabochons. I fell in love with her skull beads when I was set up next to her at a show in New York. (You can see an example of what I did with one HERE and see the ones available in my shop HERE.) Admittedly, it wasn't the most bustling of shows, so we had plenty of time to get to know each other and keep entertained. All weekend, she'd crack me up. I also found out that we share a few things... like being pack rats "fond of things" and an alma mater – the School of Visual Arts in New York City. Do make sure to swing by Lisa's Etsy shop or her de-stash Etsy shop. Both are filled with incredible finds at reasonable prices. Lisa has also recently opened a Big Cartel shop, which is also worthy of checking out. I definitely recommend swinging by her shops to see more examples of her work. To win these beads is super simple. Just leave a comment on this blog post. One person will be randomly selected from the comment section of this blog post on Monday (September 27th) at midnight EST. Please leave your name and contact information if it doesn't already appear next to your comment. This giveaway, like the others this week, are open to all participants, including international readers. A few weeks ago, Swarovski debuted their new Fall line. The new colors, Sunflower and Crystal Silver Night got a lot of press, but Swarovski also launched a new pearl color, protective coatings, graphic prints, ceramic pieces AND shapes! I'm smitten with the new Helios pendant. I can see it dripping with chain and dangles, making a really stunning focal. 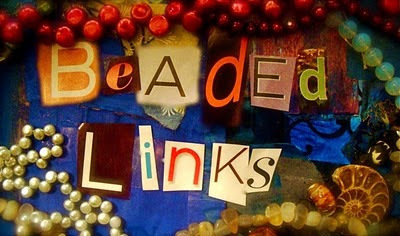 A few months ago, Margot Potter contacted me about participating in a unique challenge for her latest book project, Bead Chic. Margot is the author of five how-to craft books and has contributed to several others. CLICK HERE for a list. 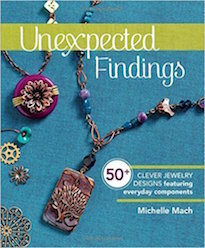 The premise of her new book is to explore the foundations of jewelry design and empower the reader with the confidence and tools to make the designs they see in books and magazines truly their own. It's all about claiming individual style! Each of the 36 designs featured in the book is accompanied by a variation, as an example of how differently pieces can be interpreted. My challenge was to take two of her lovely designs and put my own spin on them. The first challenge was to redux Margot's necklace, Nights in Tunisia. Her version is brightly colored, featuring a peacock feather pendant, tumbled stone beads and blue-coated chain. My assignment was to tackle the design element of pattern. The result is my necklace, Nights in Carthage. I kept several of the structural and thematic elements, but opted for a more earthy flare. I used a laser-engraved shell pendant from Lillypilly Designs, natural brass chain and jump rings from Vintaj, smoky topaz ABx2 Czech seed beads from Byzantium in Columbus, OH (which has recently closed), rough cat's eye from Bead Trust, and Swarovski crystals from Fusion Beads. My next task was to address the issue of color in Margot's Psychedelia Bracelet. Her bracelet boldly features the three primary colors with black and silver accents. Most of the color in her bracelet can be found in the flat rainbow calsilica ovals. My version is called, Woodstock Summer. I multiplied the three dangles in Margot's bracelet and made them take center stage. I used a mix of materials in varying shades of red, yellow and blue – semi-precious stones, faceted pearls, Swarovski crystals, Czech glass, amber nuggets and coral beads. I love the jingling movement of Woodstock Summer and how the different materials, some transparent and some more opaque, create an ever-changing pattern of cast-shadows and reflections. I think this is a good example of taking a kernel of an idea and really growing something different. 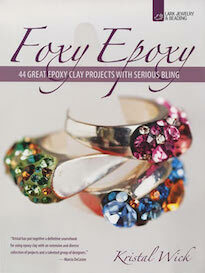 I think that this book is most excellent for jewelry designers of every level. It covers basic techniques, provides helpful tips and includes step-by-step photography, perfect for beginners. For the more seasoned designer, the book is full of inspiration and acts as a creative springboard. Margot also shares an extensive resource list, featuring unique and interesting components. A good resource list is worth its weight in gold! 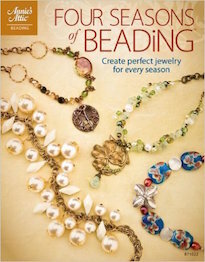 I definitely recommend checking out Margot Potter's new book, Bead Chic. This is the third installment of the Birthday Week Giveaways! Today we have a stash of sea glass bead strands from Auntie's Beads! One lucky winner will take home this treasure trove of sea glass beads! Included are strands of small seafoam rounds, dark olive nuggets, spring green grounds, opaque sky blue rounds, medium seafoam rounds, and olivine rounds. I love the satin, matte finish. They are silky to the touch, which makes them ideal for bracelets. The other great thing about the tumbled glass, is that matte finish seems to absorb light. This gives the beads an airy, soft-edge quality. For more sea glass beads, check out the entire selection at the Auntie's Beads website. There are a surprising number of colors! They offer more than just the regular bottle glass varieties. Make sure to check out the more unusual colors like strawberry, cranberry, amber, amethyst, and red marble! To win these beads, all you have to do is leave a comment on this blog post. A lucky winner will be randomly selected from the comment section of this blog post on Monday (September 27th) at midnight EST. Please leave your name and pertinent contact information if it doesn't already appear next to your comment. This giveaway is open to all readers, including international ones. When I saw the decorative porcelain toggle with the silver-plated key bar from Melanie Brooksof Earthenwood Studio, I instantly thought of architecture, particularly of castles and other grand places. I wanted to create something elegant and versatile that would show off the toggle. I decided to pair the closure with a mix of faceted pearls, Herkimer diamonds, rough rock crystal beads, quartz crystals, old trade glass, fine silver caps, Dutch glass beads from the 1700's, African recycled glass beads, Swarovski crystals, moonstone and sterling silver chain. Everything is intricately wire-wrapped in thick, fancy double wraps. The toggle can be worn in the front as a focal or it can be worn off to the side or in the back depending on your mood or outfit. I went in for my appointment, thinking that they'd remove the bump and do a biopsy today. I'd get my results in a few days and everything would be done. What I thought would happen and what actually happened are two different things. The new doctor squeezed and poked at the bump, but did no surgery. He did a basic exam and asked me if my tattoos had any special significance or if I was a drug addict or promiscuous. He said that it was paramount to take samples and run tests. So, I've been rescheduled for Friday. The bump won't be completely removed, but a sectional biopsy will be run. Then a week after that, I have a follow up appointment and if there are any results, hopefully the bump will be removed (or in some fashion treated and eradicated) at that time or shortly thereafter. It dawned on me on the drive home that this won't be quick and easy. It's going to be a long, drawn out affair that will be very expensive in the long-run. $80 here, $30 there... $15 here, $40 there... it's beginning to add up. During the drive home, it's as if a window opened up and I could see the future – a string of doctor's appointments, disrupted days and payments, payments, payments. This makes me profoundly tired. How long can I remain nonchalant and unaffected? I don't want nor need the extra worries. I just want to make things. Yesterday, we went for a walk around the property. Even though it's just right outside our door, it's an activity that I rarely get to enjoy. Usually I'm too consumed with other things, but I made it a priority to soak up some autumn air. The property is covered with leaf-littered trails that lead off into the woods. The still image does not capture the gentle shower of golden leaves or rustling of the branches in the breeze. Along the walk, I found yarrow (also known as knight's milefoil). It looks very much like Queen Anne's Lace, but lacks the single dark reddish purple flower in the middle. The story goes that Queen Anne was tatting lace and pricked her finger. The drop of blood is that single floret in the center and is one way of distinguishing Queen Anne's Lace from other similar species. Salt blocks and bird feeders are placed along the forest's edge. Deer and wild turkey are often seen down there. I found an old tree, half fallen over covered in fungi and lichens. The picture to the left is a snapshot of the gnarly trunk. The center picture is a close-up of one of the fluffy, white fungi growing upon the trunk. The picture to the right is the berries of a dogwood tree not far from the partially fallen tree. I love the bright red of the berries and the buds of the blossoms, already present seasons in advance. The walk around ended with a stop in the garden. The tomatoes are doing beautifully and we are amply stocked. The cabbages are also doing well. But the most obvious successes in the garden are two GIANT pumpkins. We had wanted smaller ones for pumpkin pies. These ones are MASSIVE. When they're ready, we'll have to go down with a wheelbarrow to haul them. They're that big! Before they are harvested, I'll take a picture with something to show scale. The above picture really doesn't do them justice.